Multiplayer Online Games (MOGs) have become a new genre of "play culture," integrating communication and entertainment in a playful, computer-mediated environment that evolves through user interaction. This book comprehensively reviews the origins, players, and social dynamics of MOGs, as well as six major empirical research methods used in previous works to study MOGs (i.e., observation/ethnography, survey/interviews, content and discourse analysis, experiments, network analysis, and case studies). It concludes that MOGs represent a highly sophisticated, networked, multimedia and multimodal Internet technology, which can construct entertaining, simultaneous, persistent social virtual worlds for gamers. 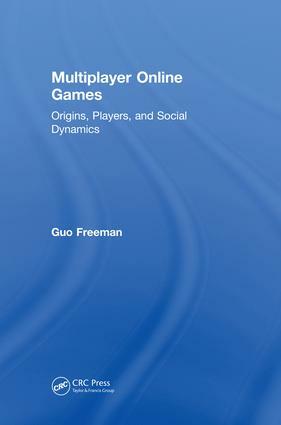 Overall, the book shows that what we can learn from MOGs is how games and gaming, as ubiquitous activities, fit into ordinary life in today’s information society, in the moments where the increased use of media as entertainment, the widespread application of networked information technologies, and participation in new social experiences intersect. Why Online Gaming Studies Now? What Are Multiplayer Online Games (MOG). Who Plays MOGs? Social Dynamics of MOGs. Methodologies for the Study of MOGs. New Phenomena, New Opportunities. Implications for Future Studies. Guo Freeman is an Assistant Professor in Information Technology at the University of Cincinanti. Her.research interests, broadly construed, concern HCI (Human-Computer Interaction), CSCW (Computer-Supported Collaborative Work), and social computing. Specifically, she focuses on computer-mediated collaboration and computer-mediated interpersonal relationships, for example: how digital games affect interpersonal relationships and group behavior, and how to design and implement games that better afford and support such new forms of intimate and collaborative experiences.